Fly anglers live for the "hatches" when trout erupt in a feeding frenzy over the mass emergence aquatic insects from the river's surface. In these moments, trout can become so focused on one specific type of prey that they will pursue only a skillful imitation. Anglers who study aquatic insects to meet this challenge find that they're as captivating as the fish themselves. Every species has its own story, its own personality. We cross paths with these characters at the climax of a perennial drama of life and death, and--as with any great drama or sport--every play means so much more when we know the players inside and out. It's not just about catching fish. It's about knowing the stream and loving everything in it. Troutnut.com's aquatic insect encyclopedia is a guide to these players and their stories. Read about the behavior of each species and view thousands of closeup photos, or join the fly fishing forum to meet other devotees of the world's healthiest addiction. 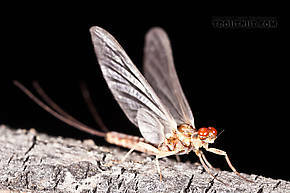 You can learn the basics of mayflies, caddisflies, or stoneflies. Or dive into the details of storied species like the Hendrickson hatch and the Hex hatch.